This is a hit at our house! I pre-heat the oven at 425 degrees. I line a pan with foil and spray it with pam. I slice our okra just like we were going to fry it. In about 1/3" slices. 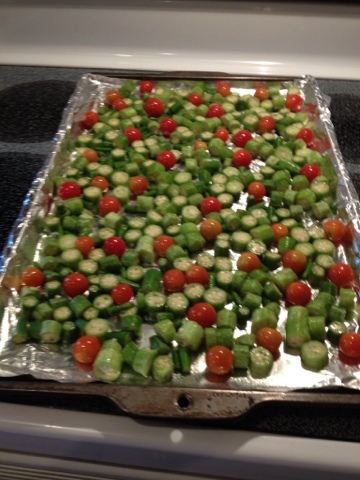 I put them in a bowl and sprinkle olive oil over them (just enough to coat the okra when stirred). I then season the okra with whatever I'd like. This time I used salt, pepper, garlic powder with parsley and onion powder. However , you can use whatever seasoning you desire...cajun is even really good too! I cook the okra for 10-15 minutes until some of the okra is crispy. I think I'll try doing this on the grill next time with whole okra instead of sliced. I'll post the results and update the blog post when I do. The photo is pre-cooked. I couldn't get a photo of the finished product due to us eating it up so fast! Enjoy the idea! YUMMY!